This is an in and out route of 68km of up and then back down again. The climb in is hard but there are two rewards for those willing to take it on: the incredible rock and alpine landscape and the ride back out. Our destination is the ski station at Haut Asco on a road partly constructed by the Foreign Legionnaires in the 1960's. I'd strongly recommend you make this a day trip. Put all the effort into the climb and then meander back stopping to swim in the river at one of the many spots close to the road and perhaps have something to eat and drink in Asco village. Leaving Ponte Leccia head north on the main road, the T30 (N197) sign posted for L'Île Rousse. After a couple of kms turn left onto the D47 signposted for Haut Asco. As the route profile shows the first 15km or so are a gentle spin through farming country. Up ahead you won't fail to notice the mountain landscape with several peaks above 2,000m and Monte Cinto, at 2,707m towering above the ride's high point at Haut Asco. 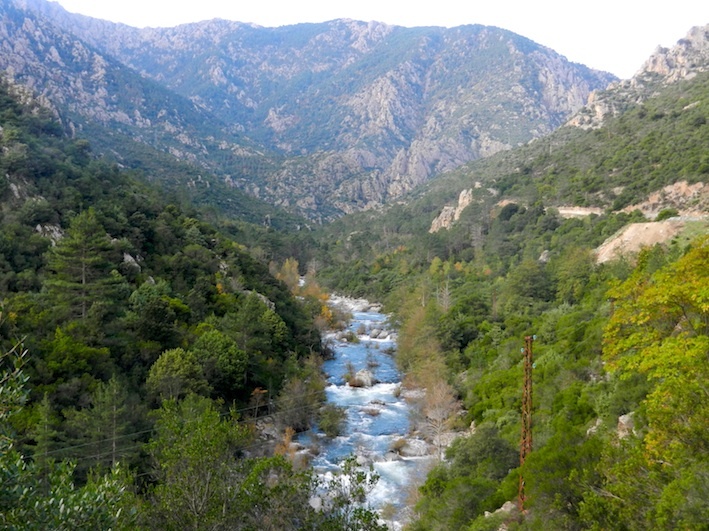 The road becomes the D147 and follows the River Asco up and into the Asco gorges. The climbing starts a few kms before the village of Asco which is about half way to the ski station. There are a number of bars and restaurants but let's leave them for later. On up twisting through the village and out the other side you're half way to the downhill bit!